1. Nonspecific chemistries usually involve the detection of an intercalating dye (e.g., SYBR green I) (Fig. 1A). 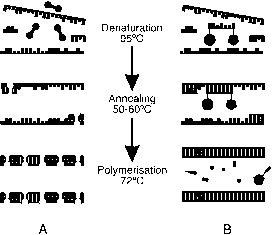 The PCR product can be verified by plotting fluorescence as a function of temperature to generate a melting curve of the amplicon. Because the melting temperature (Tm) of the amplicon depends markedly on its nucleotide composition, it is possible to identify the signal obtained from the correct product. A characteristic melting peak at the amplicon's Tm will distinguish it from amplification artefacts that melt at lower temperatures in broader peaks. 2. Specific chemistries make use of template-specific fluorescent probes for each PCR assay. These probes can be structured (e.g., Scorpions, Molecular Beacons) or linear (e.g., TaqMan, Light-Cycler probes). Probes may contain reporters and quenchers, or make use of the quenching properties of the DNA. All operate on the same principle: A fluorescent signal is only generated if the amplicon-specific probe hybridizes to its complementary target (Fig. 1B). Fig. 1 Real-time detection chemistries. (A) Nonspecific (e.g., SYBR green I). In solution, the unbound dye exhibits little fluorescence; during the PCR assay, increasing amounts of dye bind to the nascent double-stranded DNA. When monitored in real time, this results in an increase in the fluorescence signal as the polymerization proceeds, and that falls off during the denaturation step. Consequently, the increasing amounts of amplified DNA can be monitored by measuring the fluorescence measurements at the end of each elongation step. 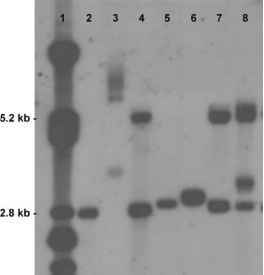 (B) Specific (e.g., 5'-nuclease; TaqMan). Although the fluorophore (circle) and a quencher (pentagon) are bound to the same probe molecule, any light emitted by the fluorophore on excitation is quenched. When the polymerase displaces and cleaves the probe, the fluorophore and the quencher become physically separated, and emissions from the fluorophore can be detected.